Since the official Forest Service map is only a sketch drawing without trail names or numbers, and the National Geographic Trails Illustrated 804 Tahoe National Forest: Yuba and American Rivers and Jeffrey Schaffer’s The Tahoe Sierra book do not agree on names and numbers, there is no single source to use. I’ve used the TI 804 numbers. The official trailheads are: Grayhorse Valley, Tevis Cup, Talbot, PCT from the north, Barker Pass, and Granite Chief in Squaw Valley. Alpine Meadows Trailhead and Powderhorn Trailhead should be added to the Forest Service list. For some of these trails, tracks are provided on Motion-X (they were created in the Motion-X GPS HD app on my iPad) and Dropbox. Motion-X says that the links expire after six months, though so far none of mine have expired. Since the Dropbox links depend upon my filing hierarchy, they may become inactive. Caveat: Anyone who depends solely upon GPS tracks and waypoints in the wilderness is a fool. If you enter without a good map in hand, may Darwin treat you kindly and quickly, and the bears and coyotes scatter your bones. Some information was updated 2014-08-11. The Pacific Crest Trail (PCT) enters the wilderness on the north just below Granite Chief peak, and exits (or vice-a-versa) just south of Twin Peaks. There are seven segments that total about 11 miles within the wilderness, or 15.9 miles from Granite Chief Trail to Barker Pass Trailhead. This trail is well described in many guidebooks, so I’ll leave it at that. Described in The Tahoe Sierra, trips 45 & 50. The portion of the trail between the Tevis Cup Trail junction and the Whiskey Creek Trail junction is also designated as part of the American Discovery Trail (ADT). I have been brushing this section of the PCT, and it is in much better shape than 2007 when I started, when it was impassible at several locations, however, there are still brushy sections that need to be cut back and maintained. The PCT can be considered in seven segment, below. Clicking the junction link will take you to the junction page, in case you want to see the signs at the junction. 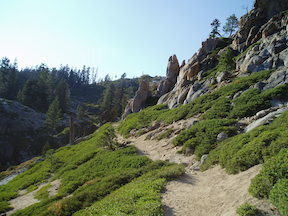 The Granite Chief Trail (16E23) starts in Squaw Valley at the main fire station and climbs to the Pacific Crest Trail a bit north of the wilderness. The trailhead at 6260 feet is to the right of the fire station, with a standard Granite Chief Wilderness information sign and a Granite Chief Trail sign, but no destinations or mileages. It passes some use trails and a challenge course, climbs to a dirt road and left to a large water tank, then becomes a trail again. There are two obvious trails coming in from the right and then the left, and the route going up is clear at these, but can be confusing coming back down, when you should take the left trail and the first split and the right trail at the second split. 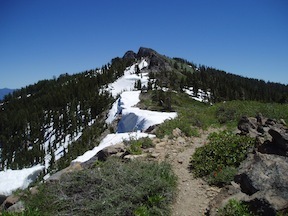 The trail ends at 8160 feet at the Pacific Crest Trail. Described in The Tahoe Sierra, trip 45. Water: There is always some water in Squaw Creek, adjacent to one branch of the trail close to Squaw Valley, and there is early to mid-season water at some small tributaries to Squaw Creek. The Five Lakes Trail (16E27) starts at the Alpine Meadows Trailhead on Alpine Meadows Road, climbs into the wilderness, and ends at the largest of the five lakes (actually anywhere between two and fifteen lakes, depending on time of year). Described in The Tahoe Sierra, trip 46. Water: no water until main lakes, except early season in tributaries to Bear Creek. 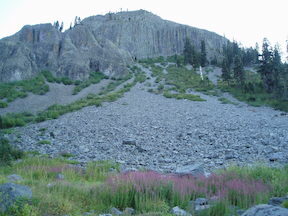 The Squaw Saddle Trail (16E27) connects the Five Lake Trail to the Pacific Crest Trail. It is often just called the Five Lakes Trail, but technically is a separate trail. 0.8 miles. 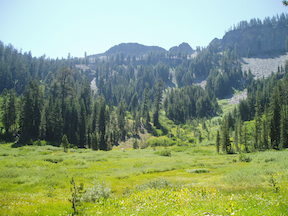 It is called Squaw Saddle because at one time the trail went over a saddle and into Squaw Valley, but this is an old alignment that is now very hard to find. Described in The Tahoe Sierra, trip 46. Water: A tributary to Five Lakes Creek flows early and mid season. 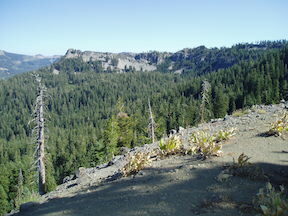 Whiskey Creek Trail (16E02) is the 0.4 mile segment from the junction with the PCT to Whiskey Creek Camp. It can be difficult to cross Whiskey Creek during early summer when the creek is high and wide at a crossing without boulders to hop. Whiskey is often spelled “whisky” on websites, some guidebooks, and signs, but the USGS map uses the “whiskey” spelling. Described in The Tahoe Sierra, trip 46. This trail is also designated as part of the American Discovery Trail (ADT). Water: Whiskey Creek is always flowing. Five Lakes CREEK Trail (15E31) extends from Whiskey Creek camp to Diamond Crossing, in five sections totaling 4.0 miles. Described in The Tahoe Sierra, trip 48. Big Spring Trail (16E17) lies mostly on the east side of Five Lakes Creek, giving access to a large meadow and to Big Spring. Five Lakes Creek can be very difficult to cross early in the season. Down trees sometimes occur that can be used to cross the creek, but may get washed away year to year. Water: Five Lakes Creek always has water; Big Spring always has water, but it is hard to find, probably easier by ear than eye. 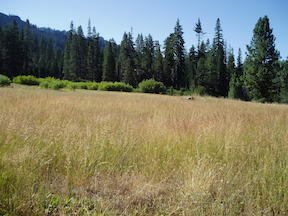 It is below where the trail crosses the dry drainage at the south edge of the meadow. The Bear Pen Trail (15E26) starts from the Five Lakes Creek Trail just south of Bear Pen Creek, and ends at a beautiful meadow in the Bear Pen amphitheater, about 2.3 miles. The Powderhorn Trail (15E15) connects the eastern wilderness boundary with Five Lakes Creek Trail. This 3.5 mile trail starts at about 7720 feet, ascends to a pass at about 7800, then descends into the Powderhorn Creek drainage, ending at the junction with the Five Lakes Creek Trail at a junction often called Diamond Crossing at about 6050 feet. Described in The Tahoe Sierra, trip 47. Water: Except in early season when there are a number of tributaries, this trail is dry from the trailhead to the crossing of the creek nearly all the way to Diamond Crossing. 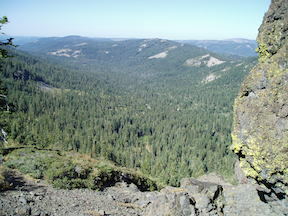 The Tevis Cup Trail (16E04) leads from the PCT to the western wilderness boundary. The TI 804 map and the FS map show two branches of this trail, one starting off the PCT just below the saddle beside Granite Chief mountain, and the other in the saddle before the PCT drops into Whiskey Creek drainage. They join and exit the wilderness to logging roads. Jeffrey Schaffer’s description of the northern branch in The Tahoe Sierra – “…was apparently built without any forethought, since the steep ups and downs are random and have nothing to do with topography or obstacles.” – is apropos. The northern branch is apparently the one used by the Tevis Cup (or Western States) endurance horse ride and the Western States 100 endurance run. The southern branch is sometimes referred to as the Western States Trail, but this name is also used for the trail through Picayune Valley. For more information about the Western States ride and run, see the Western States Trail Foundation Tevis Cup Ride. The Western States Trail southern branch has not been maintained in quite some time, but it can be followed with reasonable attention. The most difficult part is the crossing of the Middle Fork, but if you just head across the swampy area (maybe knee deep), you’ll pick it up again. The junction with the northern branch is not signed and not obvious, so it would be better to go westbound on this branch. At the wilderness boundary there is a standard Granite Chief wilderness sign which is rapidly deteriorating, and the trail continues as an old logging road to an intersection with an open logging road at a green gate. There is no sign or indication of the trail here. Water: The northern branch has several small creeks which flow early to mid season. The southern branch crosses the Middle Fork American River, which always has water. The Picayune Valley Trail (16E10) enters the wilderness at the Talbot Trailhead above the Talbot Campground, connects with the Shanks Cove Trail, and terminates at Whiskey Creek Camp, about 7.6 miles. On some maps this is called Western States Trail, and this may be a correct historical designation. The Shanks Cove Trail connects with the Picayune Valley Trail about a half mile northeast of this saddle. From the saddle the trail descends to Whiskey Creek Camp. Described in The Tahoe Sierra, trip 42. The route of this trail, and the junction with the Shanks Cove Trail, is not as shown on most maps. The Picayune Valley Trail descends into the valley from the low saddle just north of the high volcanic cliffs, which is about 7450 feet. It does not descend from the saddle to the north, as shown on the Trails Illustrated map, nor does it descend from the cliffs as shown on the topgraphic base map. I’ve GPSed the trail and it is available on Motion-X (expires 2014-01-22). This trail is also designated as part of the American Discovery Trail (ADT). Water: Talbot Creek always has water, but it can be very low in late season. The Middle Fork of the American River always has water, but there may be dry sections mid to late season. Picayune Creek (it does not seem to have an official name) always has water, but there may be dry sections mid to late season. Early season, there are numerous tributaries with water. Warning: The northern section of this trail between the drainage after the Western States trail junction and the top of the ridge is essentially impassible. A tangle of huge downfallen trees blocks and covers the trail. 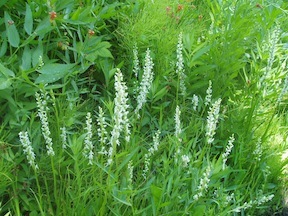 The Shanks Cove Trail (15E11.1) starts at the Five Lakes Creek Trail, connects with the Grayhorse Valley Trail, and ends at the Picayune Valley Trail (or vice-a-versa). The two sections are 2.7 miles and 1.7 miles, for a total of 4.4 miles. Described in The Tahoe Sierra, trip 49. The location of this trail, shown on TI 804 and other maps, as well as the Forest Service base map, is incorrect. It does not depart the Western States Trail at the saddle, nor does it go straight up the ridge to the south, which would be impossible. Instead, it drops from the Western States Trail into the pocket north of Shanks Cove Creek, then climbs back to the ridge. I’ve GPSed the trail and it is available on Motion-X (expires 2014-01-22). Water: Generally available in Shanks Cove Creek, but there may be dry sections in mid to late season, and it may be dry at the headwaters meadow where the trail crosses the creek. In early season there is water in the pocket between Western States Trail and Grayhorse Trail. Grayhorse Trail (15E11.2) starts at the Grayhorse Valley Trailhead on road 48-14 on the western side of the wilderness, and connects to the Shanks Cove Trail. Water: Grayhorse Creek tributaries have water in early season and sometimes mid season, but all sources easily accessible from the trail may be dry in late season. Hell Hole “trail/route” (15E17/15E18) connects Diamond Crossing with Hell Hole Reservoir, along the north side of Five Lakes Creek. Warning: The section between Diamond Crossing (of Five Lakes Creek) and Steamboat Creek, which was once fairly easy to follow, has deteriorated significantly and it is easy to lose the trail in downfall sections. Other parts are still quite visible. Bear and deer trails are often more visible than that official trail. I would downgrade this section from trail to route, matching the section west of Steamboat Creek. The “route” begins at the end of the road on the north side of Hell Hole Reservoir. There is no trailhead or sign. The trail starts just before the rough 4WD road takes its last steep descent to Greyhorse Creek, as a vague path to the left. It can be followed more or less, until it fades out near the shore of the reservoir, though it has not been maintained in a long, long time. The upward trail to Diamond Crossing is not marked by a sign nor anything obvious. It heads straight uphill just before the trail fades into the reservoir shoreline, and is marked by small cairns. With a close eye, you can follow it, and even pick up traces of constructed trail here and there. When it gets into the eroded gully, it breaks into a variety of cairned routes. Some cairned routes are good, some poor, and some just dead-end. The one I often pick leads into the bench well below the trail, but it is not hard to jump up one bench and regain the trail. Despite having been up and down this route about 20 times, I have never succeeded in following it 100% of the time. This is a route for experienced backcountry users who are good at finding vague and long unmaintained trails. At a point near the wilderness boundary and not far from Steamboat Creek, the “trail” becomes easier to follow but is still not maintained. From Buckskin Creek to Diamond Crossing the trail was maintained in 2009, but as of 2014 has a large number of down trees. Water: Five Lake Creek always has water, but it may be completely dry at the trail crossing mid to late season; upstream is the best direction to find water. Both forks of Buckskin Creek may have water, but again, it may be necessary to go downstream. Steamboat Creek has water in early and middle summer, but it may be dry at the trail crossing, and upstream seems to be the best direction. Buckskin “route” (15E16) is north of the Hell Hell Trail, in the Buckskin Creek and Steamboat Creek drainages. This trail is shown on the TI 804 map as a loop off Hell Hole Trail, of 3.0 miles. It is shown on the FS map as starting at Buckskin Trailhead at the wilderness boundary, at the end of road 48-14. This trail is non-existant for all intents and purposes. I was able to find and follow the trail up along Buckskin Creek, though there are few blazes, no cut logs, and only traces of tread. At the wildernss boundary there is a “no vehicles” graphic sign for downhill travel, and some blue paint on the trees. 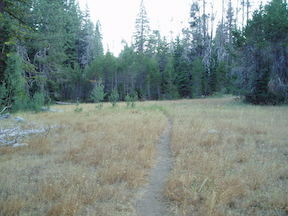 Just above here is a large dry meadow, with a large blazed tree marking the trail at the bottom, again for downhill travel. Heading up through the meadow there are no obvious markings. The trail comes out onto a logging road, and there is no indication about which way to go. Turning left along the ridge, the logging road eventually leads to the Steamboat Creek drainage, but again there is no sign or other indication of where the west branch heads back down Steamboat Creek. From the Steamboat Creek end, the trail is even harder to find and follow. There are very few blazes, no cut logs, and only vague traces of tread. The trail trace departs from the west side of Steamboat Creek, the location marked only by a blaze on a tree that is not obvious. Though I’ve succeeded in following most of this trail, I’ve also not been able to follow it on other attempts. Water: The logging road crosses a wet fork of Steamboat Creek. Don’t try to come in on the Western States trail through Squaw Valley ski area – the ski area has made such a mess of the trail (and the environment) that it is almost impossible to find and follow this trail. On the other hand, maybe you should see the trail and then consider whether to patronize Squaw Valley. This trail is not really in the Granite Chief Wilderness, but one looking at the map as I did might think that it would make a good route into the wilderness. It leaves FS 14N05 between Devils Peak and Guide Peak, descends to the Rubicon River, crosses to Five Lakes Creek, and joins the Hell Hole Trail. The trailhead sign says Rubicon River 1-1/2, Hell Hole Reservoir 2-1/2, but these mileages are clearly incorrect. The TI 804 mileage of 3.6 to the Rubicon crossing and another 1.5 to the Hell Hole Trail seem much more reasonable, and match mileage from tracing a route in TOPO!. The trail is easy to follow as far as the crossing of a dry creek below Little McKinstry Meadow, then is hard to follow through the trees until it comes out on the granite bench above the river. It is a little hard to follow off the bench and down to the river. Along the river it quickly fades in logging debris. One set of cairns leads down to the river, but there is no apparent trail on the opposite side. In exploring this area on the north side of the river, I discovered there are several cairned routes leading over to Five Lakes Creek, but no real trail at all. 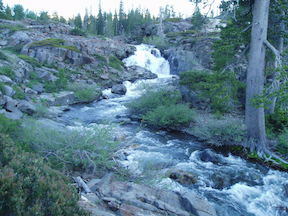 From the falls on Five Lakes Creek, several cairned routes lead west to the south and north sides of Hell Hole Reservoir. The best seems to leave the creek about 100m west of the falls. This route wanders along benches, fading out in places, and dumps out on the shoreline of the reservoir. There are some vague cairned routes above the reservoir, hard to follow, or you can walk below the high water mark all the way to Grayhorse Creek and then back onto the Hell Hole Trail, such as it is. Most of this route was never a trail, what was has not been maintained in a long while, certainly not since the logging which obscured parts of it, and there are multiple cairned routes. Only for experienced backcountry people who enjoy this sort of thing. Thank you sooooooooo much! I’m planning a trip there during May 26th to 29th. This is super helpful!!! Great. Let me know about snow conditions, and I’ll post your info.